Put the kettle on, mate! Boil water easily in an ultralight why-leave-home-without-it kettle by Optimus. This camping/hiking kettle is made of rugged anodized aluminum. 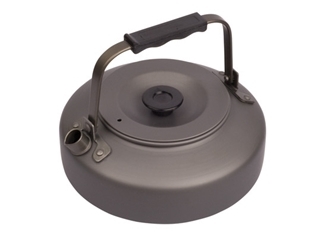 Compact, this little gem is designed to nestle down perfectly in the Optimus Terra HE or Terra Lite HE cook sets. Then snug your gas stove inside the kettle. Yes sir, you can take it (all) with you!